The Serco Yamaha team battled through a challenging days’ racing at the opening round of the 2019 MX Nationals, held in axle deep mud at the Appin Motorsport complex, west of Sydney. While both riders finished inside the top 10 in the highly competitive MX2 (250cc division), with Nathan Crawford in sixth place and Aaron Tanti in tenth, both had plenty of obstacles to deal with in one of the more brutal opening rounds in the MX Nationals history. 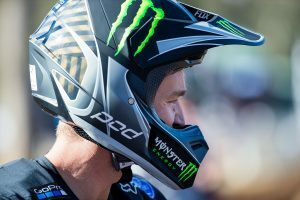 It was the first time Nathan Crawford had raced on a motocross track in eight months so his sixth place finish is a testament to his hard work and determination to recover from two major injuries. Crawford had only three weeks of bike time prior to round one and the Appin track was the worst possible situation for a rider with a leg injury, but Crawford raced well within his limits, kept a cool head and finished the day in a good position and can now battle for better results as the championship wears on. “All things considered, the weekend went pretty well for me and I came through with no issues so I leave here pretty content. Its good to be back racing and while I still have a long way to go, I felt pretty good on the bike and didn’t make any major mistakes. “I made sure I got a good start, stayed out of trouble and took my time selecting lines and where to be on the track so I could look after both my body and my bike. “Serco Yamaha again did a great job in really tough conditions and its cool to be back with the team and hanging with at the races. Its all up from here,” Crawford adds. It was a case of one mistaking proving very costly for Aaron Tanti. Tanti was in a comfortable second place, about eight seconds from the lead on the second lap when he made a mistake on the slippery track and went down. He fell into deep mud and as a result, it covered his bike and clothing and it was a battle from then on to finish. he fell again another two more times as he struggled to grip the bike and keep int under control and as a result, he slid down the ladder, eventually finishing in 10th place and disappointed with the end result. “That was such a frustrating race.” Tanti begins. “I was in second and not even thinking about anything other than keeping out of the mud and keeping my momentum going but I made a mistake and went down which made riding so hard. “I couldn’t really grab the grips and also my feet and ankles kept slipping from the bike and it led to a couple more fall, one of which I nearly got bogged. It was all on me and I throw away a good result that we have worked so hard for. “All I can do now is move on and forget about this round and redeem myself when we get to Wonthaggi,” Tanti said. 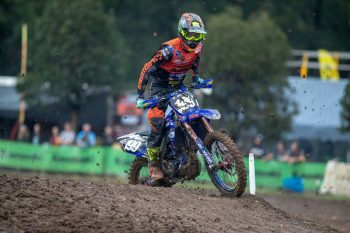 With a big clean up in the week ahead, the Serco Yamaha rig will again be on the road, this time heading for Wonthaggi for round two of the MX Nationals on March 31.